Improve your SEO and customer satisfaction with a single update. 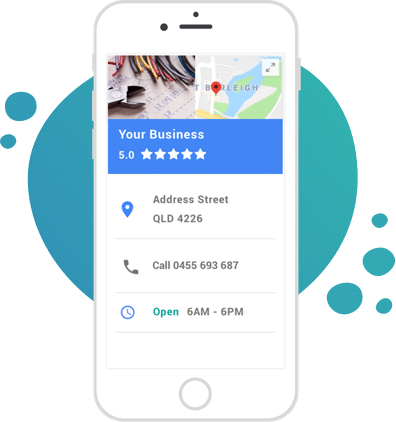 You can now refresh your details on your Facebook, Google My Business, Localsearch profile and more all at once. Our listing manager is coming soon. Get in touch to register your interest. More than 73% of people say they lose trust in a business who has incorrect details online. So, we ask you; when was the last time you checked your information? And we don’t just mean the important stuff like your business name, address and phone number. We’re talking your payment methods, trading hours, menus, services, products, branding and more. Have a headache yet? Put down the Panadol—we have a solution. Using our listing management tool, you only need to make one change and sit back and watch as every listing is updated. Even if you’ve had a late night and need to delay your opening hours the following morning, you can—and they’ll return to normal the next day. What is NAP consistency and why is it important? NAP stands for name, address and phone number. Wherever your NAP is displayed online, you need to ensure it’s 100% accurate, down to the grammar in your business name. Why you ask? Think of it this way; if Google is looking at one of your listings, social media platforms or website, they’re going to check your NAP info is all the same to ensure it’s you. When these things are different, Google doesn’t know who you are and your search engine optimisation (SEO) may suffer. So, not only do our business tools save you time and money, but they improve your organic website traffic too. If boosting your business is your goal, you'll want to check out these services too! Don't have a Localsearch listing yet? By listing your business on Localsearch, you instantly open yourself up to our 2+ million website visitors a month. You’ll also get to ride on our own SEO and SEM campaigns, as well as be able to utilise our lead-generating reviews and quotes function on your profile page. Becoming a Verified Business also gives you more options for customising your profile, such as adding photos, more of your products or services, your logo, SEO blurbs and more! When was the last time you checked the details everywhere your business is listing online? Save yourself the trouble and talk to us now.